First of all, you’ll discover that different manufacturers have completely different perspectives on this travel accessory. For some of them, it really is just a passport cover or holder, while others are making it an entire wallet or a mini-pouch that you can attach to your wrist or even neck. The image changes completely, doesn’t it? Note We Haven’t Even Mentioned… The Design, Style, Color Choice Or… Price! Our TOP 8 – Best Passport Covers Selection! I once bumped into some funny online statistics saying that you spend, on average, a year from your life looking for misplaced objects… Now, imagine how many years of your life you’d instantly loose when you’re in a foreign country and realize you’ve lost your passport! Long story short, I was lucky enough not to actually go through that situation. The thought alone scared me enough to start searching for a more serious ID holder right after that. And once I picked the best travel passport holder I could find, my travels became consistently more enjoyable and significantly less stressful. How about you, what are you waiting for? 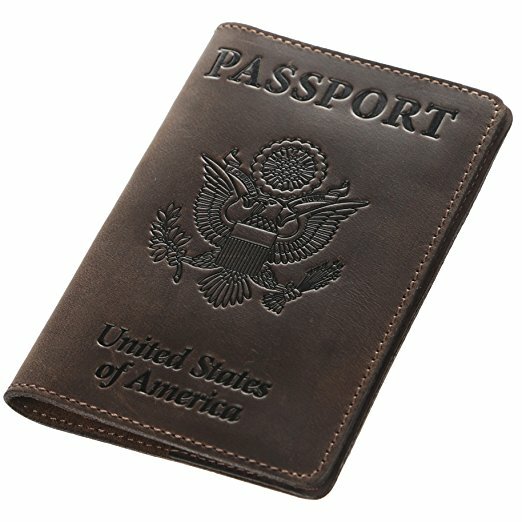 No matter what purse, backpack, or duffel bag you choose, you don’t have to ask yourself where to put your documents because there’s only one place for it – the best passport wallet. Wherever you’re stopped and asked to present your IDs, you no longer have to shuffle through all your bags and items, you pick up your passport holder and hand over the documents. If you decide to adventure yourself in crowded places, at amusement parks or local events, you can keep the essentials in your pocket and forget any other cumbersome larger bag. What’s the secret to spotting the best passport covers? Film protectors – a simple, protective PVC film that covers the front and the back of your passport. One could say that it’s a little better than no protection at all, but you can do a lot better with other options. Basic book jacket covers – the upgraded version of film protectors, these covers are thicker, made of leather or vinyl, and ready to protect against regular wear and tear. Better, but still far from the best passport case. Portfolio passport holders – these can be quite similar to the book jacket covers, but they bring in the much-coveted extra pockets, where you can slide in a lot more than the passport alone. 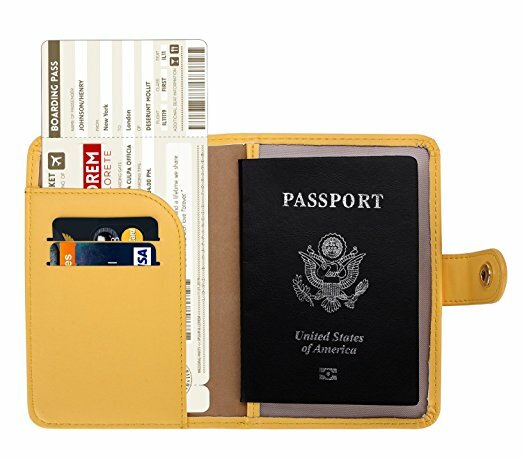 Passport wallets – you can truly think of these as to an up-sized wallet where the passport, your credit cards, travel tickets and other miscellaneous will fit in. Obviously, the best passport wallet will have to perfectly balance size and weight with functionality. And many of them include RFID protection. 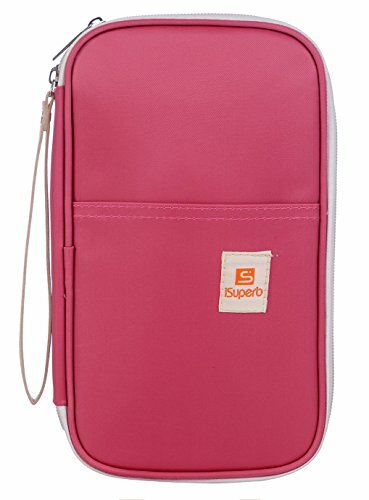 Document case passport holders – these are beginning to look like mini fanny packs, only that designed to wear at the wrist or neck, not around the hips. And you can certainly find them in a wide range of models, from designer labeled, fashionable, leather cases to simpler, lighter and more practical vinyl holders. Once you know what kind of options you will encounter, you should set up your expectations a little bit. Again, like with choosing so many other travel accessories, the best passport case will come down to your travel style and needs. What fabric and style combination would work for you? Do you want a high-end product, elegant and stylish, perhaps even with a designer label and made of nothing but genuine leather? Do you need a waterproof material like the lightweight RipStop nylon or you’re good with fancy leather or even PU leather, the one that’s been overlaid with polyurethane coating? Or, perhaps, you’re willing to give up the fancy and bulkier models for a simpler, cheaper model that you don’t have to worry too much about maintenance and where you won’t be holding too many documents either? 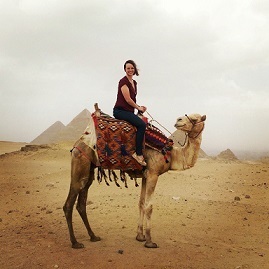 Are you a backpack traveler and will need to access your documents easy and keep them safe, without worrying that someone could be sniffing through your belongings behind your back? Or you’re more like the seasoned traveler who takes flights and rents cars and doesn’t need to worry too much about the company that will show up on the way? Any special concerns about your data’s safety? Are you really concerned about the Radio Frequency Identification scanners out there and willing to pay a few extra bucks for RFID protection? Answer these questions and the image of the best passport holder for your particular needs will be clearer and clearer. While you do so, check our top 8 products selected below and see if anything matches! 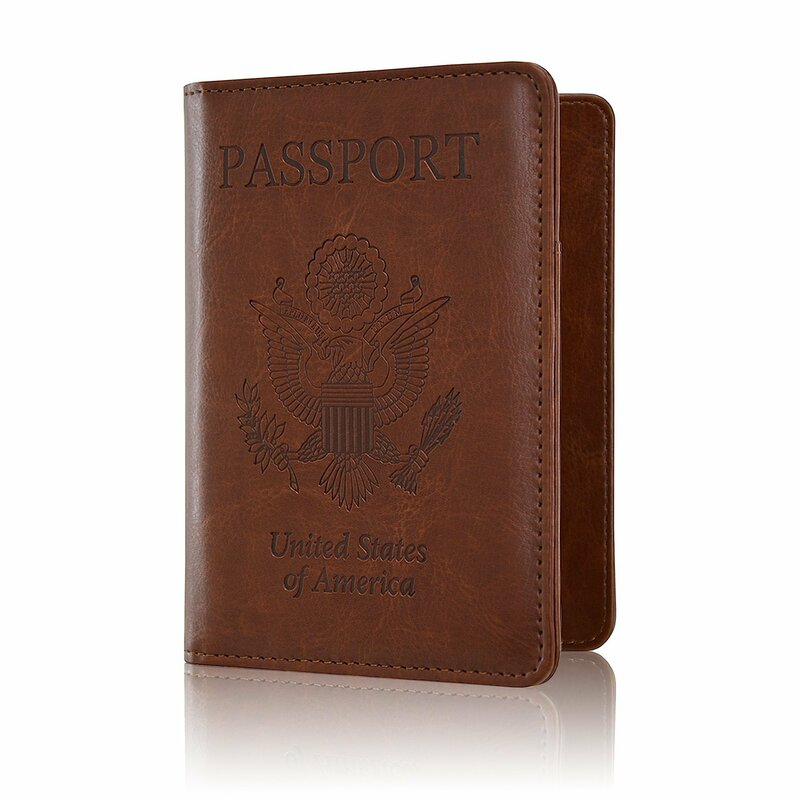 The Travelambo RFID Passport Holder Wallet is, in our opinion, the best travel passport holder in this selection of top rated best passport covers. A classy model, made of 100% genuine leather, with RFID lock slots, it weighs 3.2 oz and measures 5.9 x 4.1 x 0.2 inches. You’ll find it available in 6 different colors and two models – without strap and with snap button closure. Comparing this Travelambo RFID Passport Holder Wallet with any other potential best passport holder out there, you’ll notice it’s one of the most affordable choices. It gives you 1 special passport slot, 4 credit card slots, and 2 pockets for currency. And its style will suit all genders, allowing you to express your personality through the selected color. Simple and elegant, practical and affordable at the same time, it’s definitely our recommended wallet for any traveler! Comes with a very attractive price for a handcrafted product. With the passport inserted, there’s little room left for currency and no room for coins. One look at the Shvigel Travel Wallet will reveal a fancier, significantly pricier version of the Travelambo RFID Passport Holder Wallet. Sure, it’s not just the same 100% genuine leather and no-strap wallet format. The compartmentation is slightly different and it comes packed for gift-giving. Plus, it has some bonuses in the box. For the extra bucks, even the leather feels a bit softer, but all these details are not necessarily on top of buyers’ preferences, hence our rating as the second-best passport case. This Shvigel Travel Wallet weighs as little as 0.3 oz and measures 5.1 x 0.4 x 3.9 inches. It has only 6 slots – one for the passport, a deep pocket for tickets or cash, and 4 card slots. Yet it makes up with the 3-year warranty and the 11 colors. If you ignore the fact that it’s the most expensive in our best passport covers selection, you’ll want to hear more about it! Includes some welcomed additions in the package, like the protective sleeve and key-chain. A bit on the small size, though it will fit easier in a jacket pocket compared to other models. Looking for a similar pattern? The ACdream Passport Holder Case has the same detailed embossing of the Great Seal of the U.S. as the second-best passport case, the Shvigel Travel Wallet. Its compartmentalization, however, is closer to the one of the Travelambo RFID Passport Holder Wallet. 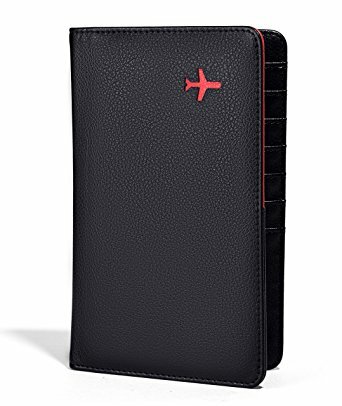 By contrast, it has the most attractive price - compared to any other potential best travel passport holder we have selected – and possibly because it’s made of PU leather. But what it may lack in quality of execution or smoothness, it can certainly compensate through its selection of 25 colors. This ACdream Passport Holder Case is also reasonably lightweight, at 2.4 oz, and measures 5.7 x 4.1 x 0.6 inches. It has 6 compartments with a standard positioning – 4 credit card slots, 1 slot for your boarding pass or other tickets and, of course, 1 pocket for the passport. Take a look at the entire series and you’ll have a hard time picking the nicest best passport wallet in there. Offers one of the most reasonable prices for a PU leather product. Colors might look slightly different in reality than advertised over the web. The Travel Neck Wallet Passport Holder is the only model in this top 8 best passport covers with a neck strap. The fact that you can carry it under your clothes and, of course, the 100% lifetime money-back guarantee are two of its greatest assets. You’ll notice a major difference in terms of design as well, being made of 210D Rip-stop Nylon. And considering that it comes in only 3 colors, you could say that you don’t have too many options. It is very affordable and has an irresistible lifetime money-back guarantee. The extra storage space can make you stash in a lot more than you should. Back to the common format, this GDTK Leather Passport Holder Wallet is a combo of synthetic leather and polyurethane and polyester lining. The bright and fun colors will certainly catch your eye, considering that you have 13 versions to choose from. You might have the feeling you’ve seen this format before… And you did, with our other best passport covers, but there are some slight differences, apart from how the synthetic leather looks and feels. The GDTK Leather Passport Holder Wallet measures 6.1 x 3.6 x 0.8 inches and weighs 3.2 oz. You should be able to store in it, aside from your passport, 4 credit cards. And you also have a special slot for keeping all kinds of travel papers, as long as they’re not too bulky. Just like our previous examples of best passport holder, this one meets all the basic requirements and functionalities of a plain wallet. More about its pros and cons are listed below. RFID Blocking lets you travel without worrying about any electronic theft attempts. The overall feel of the fabric is debated by some buyers, though, this is no genuine leather. In a nutshell, the All in One Travel Wallet could be the best passport wallet for you to stash in pretty much everything. It has 11 compartments, 7 of which are credit card slots. Setting aside the special passport compartment, you also have a slot for tickets and a compartment where you can keep your cash without having to fold it. One might even sneak in 2 passports in this 7.1 x 4.4 x 0.32 inches and 4.8 oz wallet! Comes with a stylish gift box, just in case you want to surprise a fellow traveler. It has no RFID protection, something that numerous buyers would look for. The Zoppen Passport Holder is one of the few versions with snap button closure that we’ve considered as a potential best passport case. Made of eco-friendly materials and similar in size with the GDTK Leather Passport Holder Wallet, you might notice that it also has the fewest compartments among all of our previous suggestions. At the same time, it has the second richest color selection and those 17 color choices are often praised by its buyers. It is one of the lightest models of this kind. Its thickness could also take you by surprise. The ISuperb Passport Wallet ends our top 8 best passport covers with a unique wrist strap design and zipper closure. You’ll have to agree with us, it’s more than what traditional holders seem to offer. And the similarity with the Travel Neck Wallet Passport Holder is also notable – we’re talking about the extra storage space, of course, because the carrying option is way different. This ISuperb Passport Wallet is the second model reviewed, so far, made of durable, waterproof polyester. It comes in 5 colors (Army Green, Dark Blue, Pink, Purple, and Red) and features 14 pockets – 2 on the outside (external, frontal phone pocket and back zippered pocket for important items) and 12 on the inside. You have no less than 7 card slots, plus a pocket for small things, a cash pocket, a pen slot and some other useful compartments! Of course, it is also the heaviest, at 4.8 oz, and it measures 8.7 x 1.4 x 5.3 generous inches. Should this one be the best passport holder for your needs? Can easily act as a travel documents organizer for the entire family. The credit card slots could have been a bit tighter.